Lawson HMV Entertainment, Inc. started sale “X JAPAN Lucky Dip” on order for oversea fans on 10 Dec. 2015. 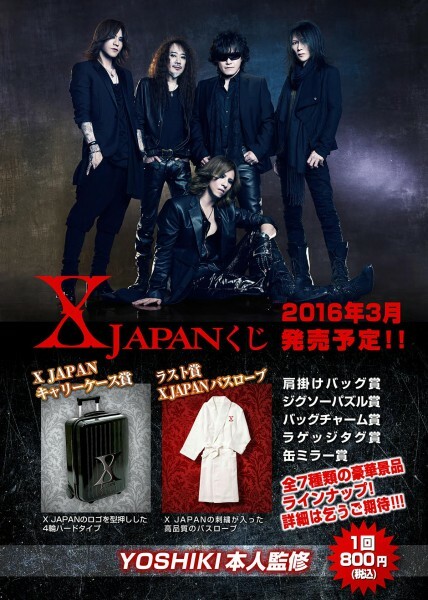 The lineup of prizes includes X JAPAN’s logoed Hard Carry Case and a Luxury Bathrobe. In total there are 7 gorgeous prizes all personally chosen under the supervision of YOSHIKI. Must-have items for any diehard fan! It’s the first attempt for Lawson HMV Entertainment, Inc. that produced on order for oversea fans; and it’s the promising of all oversea fans. Please check conditions for sales on the official web site. ※Some prizes are packed more than one. Please check prizes and detail before you purchase. ※It’s only for oversea fans, and cannot ship on Japanese address. ※It’s may be canceled, if any shipping terms. ※Only sold separately in Japan, and it sales at a store. Lucky dips of idols and musicians merchandise are popular in Japan, and often sold at convenience stores or hobby shops. They are not only of idols and musicians, but also anime & comic books.